The price is part of the plan. On Amazon, iTunes, and the like, we plan to list the Dictionary of Victorian Insults & Niceties at the sale price of $0.99, while offering our supporters the opportunity to give the book away for free. We want to get the Dictionary onto as many iPads, computers screens, Kindles, and eReaders as possible. Though the Dictionary sells itself, we are developing additional strategies to achieve this goal, which will include a press kit, and outreach program. Outside of targeting the usual sources for book reviews, we will also be targeting historical sites (both geographical and on the internet). Projected sales are a difficult thing to measure. Garnering an average of 150+ views per day, the statistics for, author, Tine Hreno’s similarly themed research blog indicate that posts related to Victorian slang consistently rank in the top 25% most popular. Though Hreno promotes her blog on Facebook and Twitter, most people visit her blog after conducting a Google search for topics they are interested in. All of this means that there’s a big demand for Victorian Slang, and the more we let readers know the book exists, the higher the sales will be. The Dictionary project incorporates two kinds of advertising: the kind outlined above to promote the dictionary itself, and the advertising that will appear throughout the book itself. The advertising inside the book will follow strict formatting and style guidelines, designed to enhance the reader’s enjoyment of the book rather than irritating and distracting. Toward this end, Hreno has looked to the Victorians for inspiration, and found it in Charles Dickens. 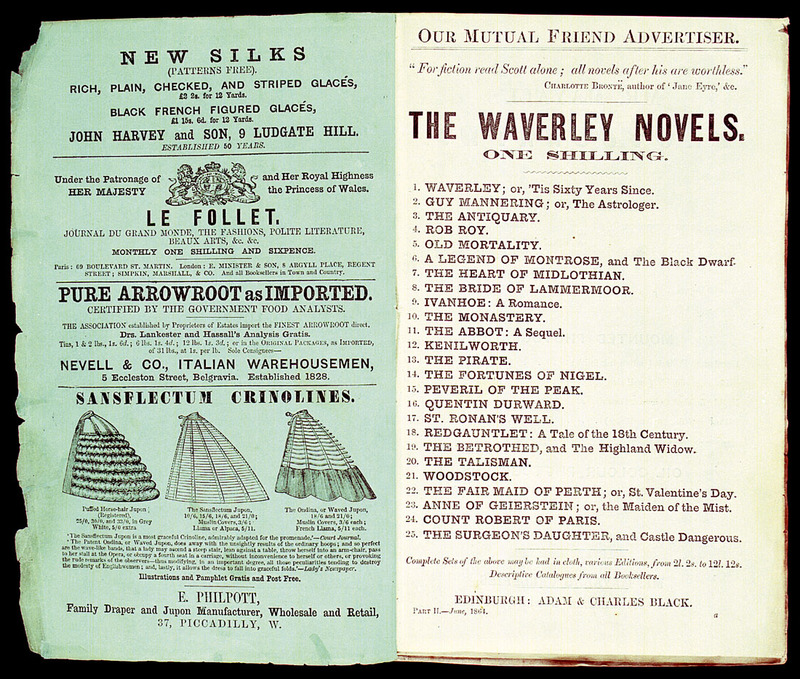 Dickens used every opportunity he could think of to capitalize on his work, including selling adverts in his books and periodicals. Unlike Dickens, Hreno is not going to sell space to anyone and everyone willing to buy it. The temporality of Dickens’ adverts makes them charming to modern viewers. The style of art encapsulates Dickens’ stereotypically Victorian entrepreneurial spirit, and the products advertised reflect Dickens’ world. Likewise, the style of the adverts in the Dictionary will reflect that Victorian spirit, by mimicking Dickensian style, and the careful selection of products advertised will reflect what is happening with Victorianism and historical fiction today.